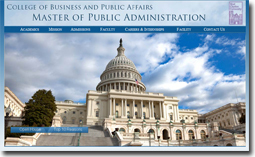 Since 1995, we have been creating websites for companies, non-profits and government agencies. Below are just a few of the hundreds of websites we have published. Each one is a custom designed by our staff of young and talented webdesigners. Many of these clients also have chosen to have us maintain and update their sites and/or host their sites. The Barnes Foundation is one of the largest art collections in the world. We began designing their first website in 1999 and continued to support them for more than a decade. The website included an on-line reservation system, an e-commerce store and EAD Finding Aids that our staff created. When they moved from the original Barnes' property to downtown Philadelphia, they required even more features (restaurant, parking, donations) that we were unable to provide. We are proud of our students' role in creating the website that let this glorious collection be seen by the entire world. Quaker Media is owned by Pat Croce, former President of the Philadelphia 76er's, and Tim Chambers, film writer and director. We developed this website for their media content development group. We also designed a website for another of their projects, the movie Our Lady of Victory which was filmed entirely in the Philadelphia area. 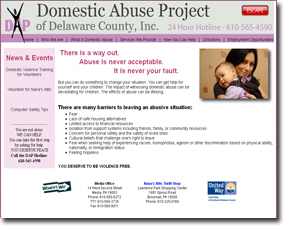 This webpage was designed for the Domestic Abuse Project of Delaware County. We work with many non-profits. A unique feature of the site is the "Escape" button that lets the viewer immediately leave the page in case they don't want to be discovered seeking help. Created for the new MPA degree which has become one of the largest Master's programs in the area. Mazzitti & Sullivan are a comprehensive Employee Assistance Program providing for the needs of companies and their employees throughout North America. We created their original website with a "special-access" password protected section and multiple order forms for brochures and materials. QR Pharma, Inc. is a specialty pharmaceutical company founded to develop novel drugs for the treatment of Alzheimer's Disease. They wanted us to present their existing logo in an unusual way and to include the artwork of William Utermohlen who chronicled his experience with Alzheimers. Milestone Events is a special event venue in West Chester that hosts important gatherings and milestone moments. The client wanted to provide an elegant website for their customers. The Criminal Justice Department wanted a new and dynamic website that would provide a unique view of the varied careers available in the criminal justice field. We came up with a busy "desktop" littered with file folders, polaroids and memos. We are in the process of designing and developing an new site for the Insurance Society. This project also includes extensive work with their large database of on-site and on-line courses and seminars. Although we normally use PERL for our database projects, this client was already using ASP so we were able to draw on the University to provide skilled programming in that area. This movie about the first national champion in Women's NCAA Basketball is set in the Philadelphia area and features Immaculata College and West Chester University. We developed and designed the website for this movie and continue to maintain it. The website includes a prominently displayed video trailer for the movie. Easy Walking.com provides physically disabled people a new hope for walking. With the 'Up 'n Go' handicapped individuals can now stand and move on their own, bringing them a new independence. This client is starting a new television show and wanted an bright upbeat website for the kids. Our artistic staff created numerous custom graphics for this site. In 1997, Governor Tom Ridge hired IPG to develop a website for his Commission on African American Affairs. Working with the Commission, we developed their first website and maintained it for years. In addition to the Governor's Commission, we designed several Pennsylvania websites including the official Pennsylvania Travel and Tourism website. Historic Yellow Springs turned to IPG to develop their first website. We maintained it for several years until their artists became adept at webdesign and took it over. But you can still find our logo on the "Civil War" exhibit! Among our many commercial clients is the Judge Mobile Wash company which provides commercial, industrial, residential and fleet vehicle cleaning. We provided the owners with assistance in setting up easy to use navigation and with choosing and scanning photos. When the non-profit "Nueva Esperanza" was growing from a Philadelphia organization to a national development corporation, we created their first online presence which included a sophisticated Learning Management System and five different websites. Using the resources of the university, we also did extensive content development for Nueva Esperanza. Nueva Esperanza has become one of the most influential hispanic organizations in the country. This national organization of history professionals asked us to redesign and maintain their website. One of the Commonwealth's economic incentive programs, PA BioTech's website needed a high-tech look. We also created an event listing system and a password access section for members of the organization. 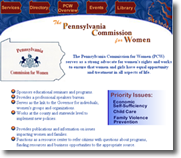 We created the first website for the Pennsylvania Commonwealth's "Commission for Women". It was one of Pennsylvania's first websites that dealt with family violence and how to prevent it. Unfortunately, all we have from the original site is this thumbnail image. This is now a "vintage" website. It was first designed in 1998 when we were approached by the Pennsylvania Dept. of Aging. Their web presence consisted of one paragraph on another department's webpage. That was shocking considering that Pennsylvania is second only to Florida in the number of elderly in our state. We developed their first website of over 400 pages and worked closely with their office in Harrisburg to maintain and improve their website for years. We developed this website for a non-profit organization. They have one of the largest collections of vintage computers in the world, including rare and one-of-a-kind items going back to 1834. The collection is used as a learning tool for students who are studying the history of technology. The College of Arts and Sciences wanted a website that would help them recruit high school seniors who had an interest in the sciences. We developed a site that was aimed at high school students and included such features as 360° virtual tours of their labs. 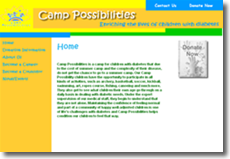 We developed this website for a non-profit group that runs a summer camp for children with diabetes. IPG has done many sites for non-profits and, being a not-for-profit organization ourselves, we recognize the special needs of the non-profits. The College of Education asked us to develop a way communicating their work to other educators as part of a federal grant. They were looking to transform education by assisting Pennsylvania Teachers in becoming more proficient with technology. One of the original "Charter Schools" in Pennsylvania, the Chester County Family Academy turned to the University to develop their first website. Using images supplied by the client, including drawings from the kindergarten children, we developed and continue to maintain their website.